Last week, as I was pulling weeds in my flowerbeds (as always, amazed by the tenacity of dandelions and crab grass), I reached under a shrub to pull a particularly stubborn root. I felt a sting and drew back my hand to see dozens of fire ants scatter. I had disturbed their mound, and the ground wa s alive with tiny workers scrambling to rebuild their fortress. 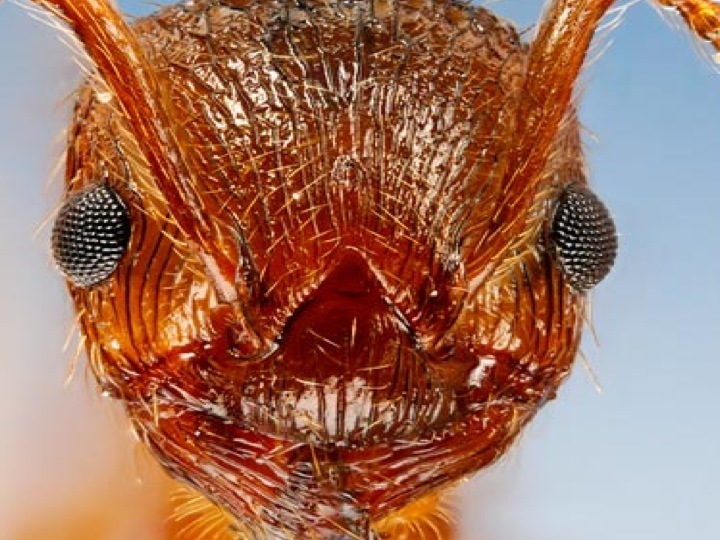 Somehow, those many individual ants worked as one in response to the disaster. Although it looked like chaos to me, these ants were synchronizing their actions to respond to a huge change in their environment. Together, they instantly adapted when their home was destroyed, and, I’m sure, will sustain a healthy system either there or somewhere else in my flowerbed. I will adapt, too, by looking more closely next time I reach under those shrubs. That is “adaptive capacity” in action. We think of adaptive capacity as individual and collective learning in response to changes within and outside the system—learning that shows resilience and supports sustainability. That working tangle of ants in my flowerbed provides a powerful metaphor for adaptive capacity in professional development systems. As a leader of professional learning, I have spent years trying to help individual teachers think about their work, assess student learning, and develop more powerful teaching skills. I assumed that excellent teaching in each classroom would somehow improve student learning throughout the system. I never thought about whether improvement in these individuals contributed to the adaptation and responsiveness of the whole system. I was wrong, and I should have known better. As early as 1972, Fullan and Loubser claimed that adaptive capacity . . .
involves the capacity of the system to attain its goals in the face of a variegated and changing environment. . . it also means that the system . . . has the capacity to change aspects of the environment in accordance with needs of the system, as well as to adapt to those aspects that it cannot change (p. 272).
. . . relentless development of what we call ‘capacity building’ – to make learning more exciting, more engaging, and more linked to assessment feedback loops around the achievement of higher order skills (which I have called the new average) – is the main agenda. (Fullan, 2011, p. 19). Evolutionary biologists talk about the adaptive capacity of species (like the cockroach) to survive natural disasters and widespread extinction. Ecologists talk about the adaptive capacity of ecosystems (like wetlands) to rebound from natural and man-made disasters. Economists talk about the adaptive capacity of corporations (like Apple) to respond to changing markets. Policy-makers talk about the adaptive capacity of communities (like Ferguson, MO) to respond to violence and racial tension. A class of fourth grade students notices bullying on the playground and decides to take action. After experimenting with project-based learning, three fifth grade teachers decide to develop a grant proposal to fund a field trip for the whole grade level. An entire faculty identifies patterns in student writing portfolios as the first step in planning a year-long focus on academic vocabulary across content areas. When the principal makes a presentation to the parent-teacher organization about students’ writing progress, the group agrees to fund a series of Saturday writing camps for students and their parents. Imagine that all those instances are happening on the same campus. When that happens, we can be pretty sure that we are seeing adaptive capacity. Individuals and groups are seeing patterns in their work, making sense in terms of what they’d like to see, and taking action to make their system more sustainable, more resilient, and more supportive of individual and group learning. That’s adaptive capacity in action. See, understand, and influence patterns across our system. Recognize and build on assets of self and others. Teach and learn in every interaction. Look for the true and useful. Attend to the whole, the part, and the greater whole. In the schools and classrooms where I work, this list helps us work together build adaptive capacity in support of student learning. They were both—from different perspectives—noticing, naming, interpreting patterns. They were learning without paying attention to the process. Learning happens whether we pay attention or not. The brain is a learning organ, and the healthy brain must learn—that’s what it does. When human beings engage with the world, we learn. We notice, name, and make sense of patterns in our experiences. If we think of “learning” in this way, we can see it daily. Hourly. Minute-by-minute. Learning doesn’t have to be a deliberate (or painful) process, but in schools, where our business is learning, we need to make the process more visible and deliberate. We need to set conditions so that learning can happen. The question is this: How do we ensure that this natural and necessary learning process happens every day, for every student? This is not a new question. (John Dewey had quite a bit to say about it, for example.) But across the complex landscape of teaching and learning in schools today, educators and policy-makers have yet to answer that question in a coherent or systemic way. We see “best practices,” mandated programs, and accountability schemes, but none of those have yet answered that question in a coherent or sustainable way. Here’s an alternative. It’s not an answer, but it’s a way to search for answers—Adaptive Action. Adaptive Action is a deceptively simple inquiry/action cycle that makes learning a systemic function in complex system. What? — What do we notice? 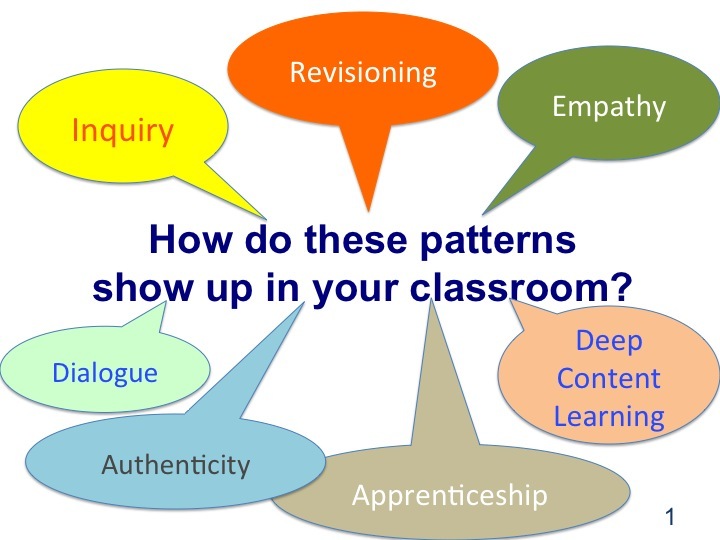 How do those experiences, observations, perceptions create patterns? So what? — So what do these patterns mean? to us? to others? What might have caused these patterns to form in this way? How might they trigger new patterns? Now what? — Now what shall we do next? Now what are our new questions? 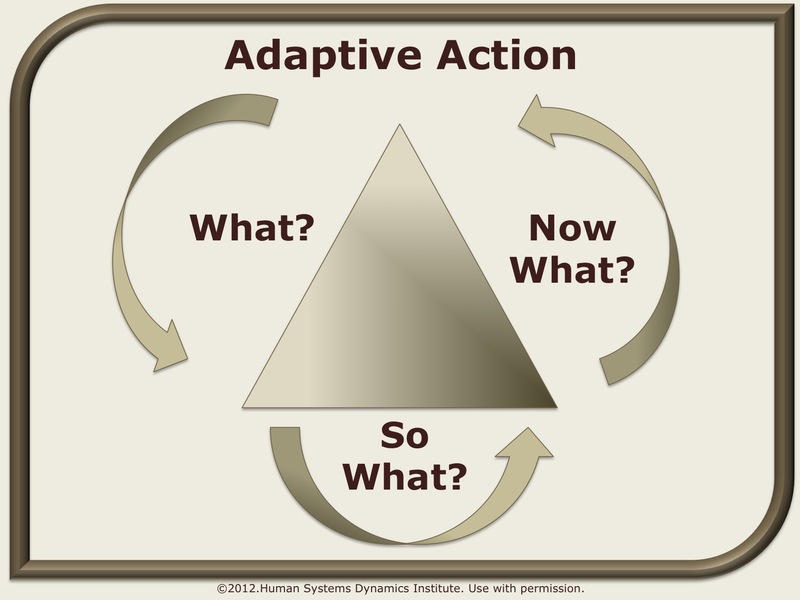 Adaptive Action is not about conducting a long-term inquiry before taking action; nor is it a series of action steps before a summative evaluation. 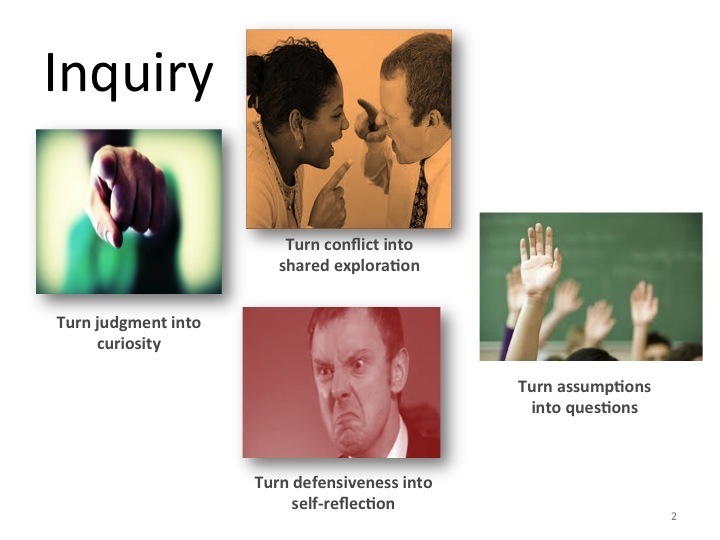 It is an iterative cycle that integrates inquiry and action at each moment. It’s about always and ever taking an inquiry stance. What is happening? So what does it mean? Now what shall we do? Just a few days ago, I was again driving the granddaughters home after dinner. This time, we couldn’t locate the moon. 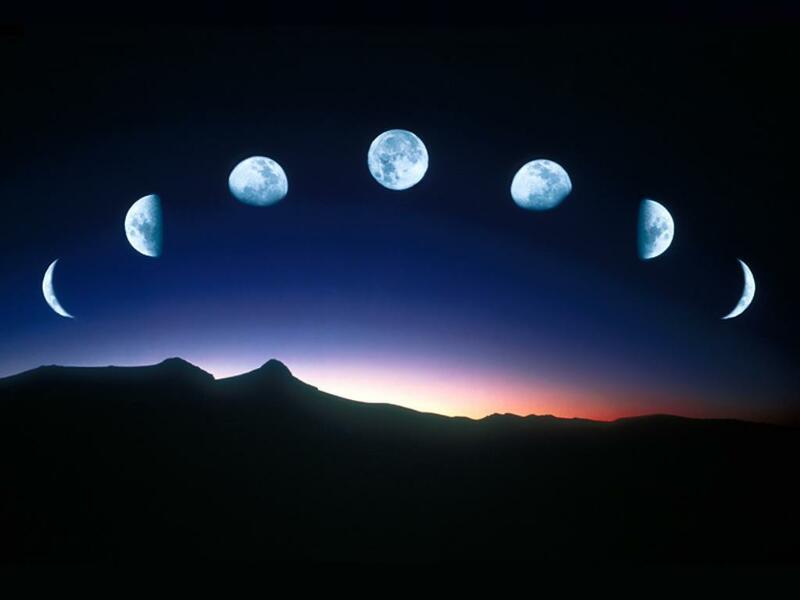 . . “Where’s the moon?” Brooke wondered. “Where’s the ball moon?” she demanded again, almost in tears. Uh-oh—an interruption to the pattern that had been so noticeable just weeks before. What happened to our moon? It was another Adaptive Action cycle at work. And another lesson about learning. Eoyang, G. H. and Holladay, R. (2013). Adaptive action: Leveraging uncertainty in your organization. Palo Alto, CA: Stanford University Press. This blog was first posted to http://www.generative-learning.org in March 14, 2014.